Strengthen your woodworking skills by learning which adhesive works best for the project at hand. We've got the five types of wood glue to know and top-rated recommendations for each. Wood is one of the most beautiful building materials, with its unique grain patterns and natural tones. Its soft, porous surface makes it easy to connect via nails, screws, or glue. In fact, more often than not, you’re using a combination of fasteners: A little wood glue applied between pieces of wood before you screw them together will strengthen any bond. – Are you joining two surfaces or filling a gap? Is the bond meant to last, or is it a temporary fix? Will the bonded or filled surfaces stay inside, or will the glue need to survive outdoor conditions? Your needs, as determined by these questions, will help narrow to the type of wood glue best suited for your particular woodworking project. This guide will inform you of your options—each formula, along with its strengths and potential drawbacks—as well as the best wood glues based on honest reviews from consumers. When shopping the home improvement store for adhesive, you’ll see pretty quickly that there’s not just one type of wood glue—rather, there are five main varieties. Most wood glues are synthetic polymers or resins that are stronger than the wood itself, one exception being hide glue, which is made of animal collagen. In addition to makeup, these glues also differ in terms of bond durability, flexibility, toxicity, and waterproofness (some may even affect your wood’s finish more than others). 1. Polyvinyl Acetate (PVA) is a rubbery synthetic polymer that creates a flexible, permanent bond. This wood glue is non-toxic (except when ingested), water-soluble (thinned by stirring in small amounts of pure water), and ideal for a wide range of projects, especially for non-structural wood-to-wood bonds. White varieties of PVA are designed for indoor use, while yellow varieties (also called “carpenter’s glue”) are formulated for outdoor use. If you need a water-resistant glue, always check for “waterproof” on the label. PVA will leave a residue, affecting your wood’s finish—especially oak. Another drawback is that PVA does not accept wood stain very well. If you try to stain the dried glue, it will look patchy. Make sure you wipe away any excess glue with a Q-tip or sponge before it is dry. For best results, press the pieces of wood together with a clamp until the glue is dry. If clamping is not possible—for example, if you want to glue a wood plug into a screw hole—add pressure by hand for a few minutes. Then allow air circulation (from an open window or fan) to create a strong bond. Know that PVA glues are basically permanent; once dry, the glue cannot be reversed or removed for repairs. 2. Polyurethane is a synthetic plastic resin that creates tight, lasting bonds. Used for everything from paint to wood floor finishes, polyurethane is also a major ingredient in many wood glues. 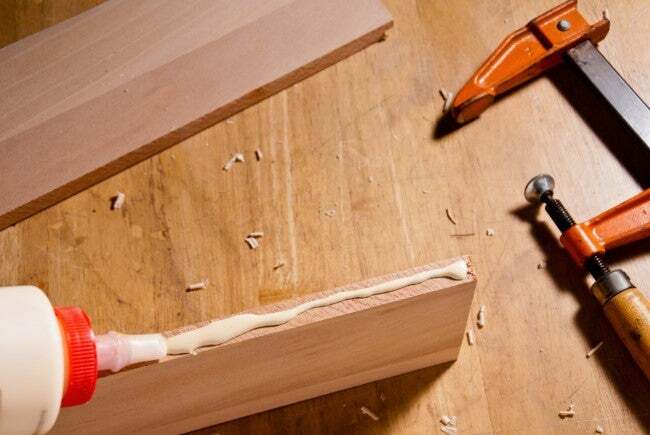 These wood glues excel when joining wood grain end-to-end—for example, if you need to connect two pieces of crown molding—forming flexible, durable joints. Polyurethane is moisture-activated, meaning it relies on the moisture in the air to set to set, so it bonds very well in humid conditions unlike other wood glues and doesn’t dry out sensitive wood fibers. This toxic chemical needs to be handled with care. Always work in a room with good ventilation, and wear a face mask and goggles to avoid inhaling glue fumes. If you intend to stain your wood, know that polyurethane goes on more easily than PVA. Still, remove any excess glue with mineral spirits—water is not strong enough. 3. Cyanoacrylate (CA) is a quick-drying acrylic resin—and another name for “crazy glue” or “superglue”. Once cured, these bonds are very hard and rigid, which is helpful if you only need to create a temporary bond—a couple taps of a hammer or mallet will break it. CA glue can be used to apply glue blocks, or short strips of wood designed for reinforcement, to the back of a fresh furniture joint for as long as they’re needed. It also comes in handy for filling cracks when mixed with sawdust. Unlike other wood glues, CA glue will not bond to a dry wood surface and requires the wood be slightly damp before application. It does, however, bond almost instantly at room temperatures, so it should be handled with care and precision. Wear a mask and protective gloves when working with the runny, water-like glue; if any glue touches your skin, remove the superglue with acetone (nail polish remover). 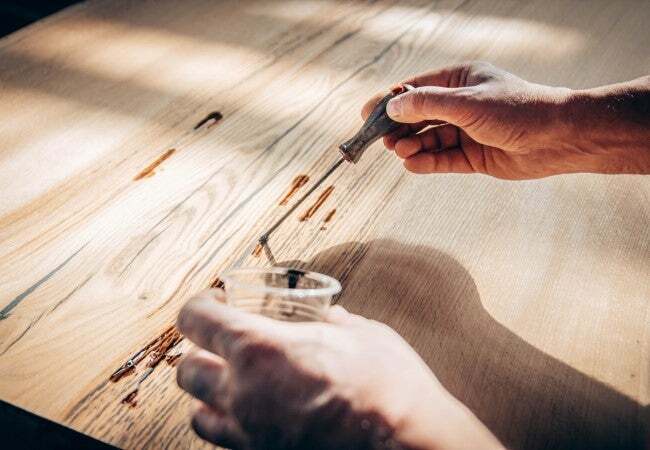 Acetone can also be used to remove excess super glue from your work surface, but this chemical solvent can also damage your wood finish if not used carefully. Its short shelf life means that CA glue will only work on near-term projects, good for about a year when sealed but as little as a month after opening. 4. Hide glue is the all-natural choice for wood furniture repair. Basically boiled animal collagen, hide glue comes in two forms: liquid and solid crystals that are melted in a hot water bath and applied with a brush. The liquid (room-temperature) hide glue utilizes urea crystal additives to keep it fluid and allow more time to work. Hot glue, in contrast, will cure as it cools soon after application. Today, woodworkers choose both forms of hide glue primarily for the leeway (i.e. reversibility) it offers as it dries and its natural, lubricating properties. It creates lasting, yet flexible joints—which is why many antiques are still repaired with hide glue. Using this adhesive preserves the quality of antiques and honors traditional craftsmanship. 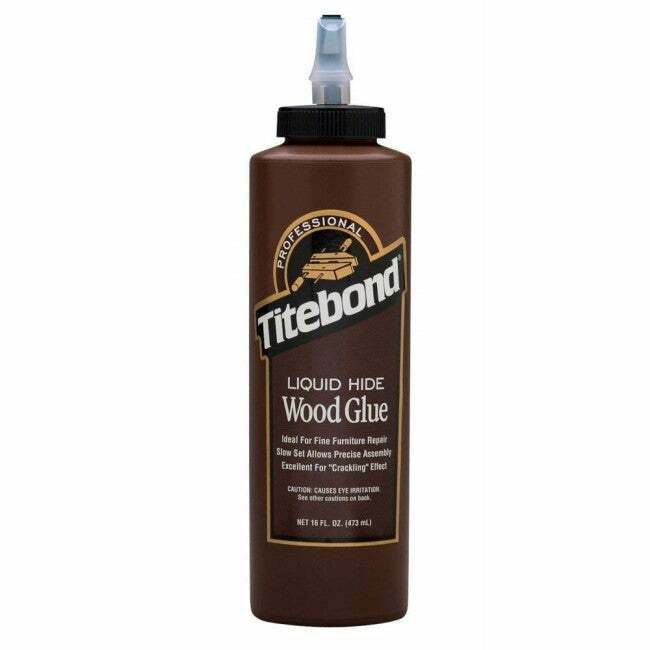 In liquid form, hide glue gives you more time to perfectly fit two pieces of wood. When fully set and dried, it is an excellent choice for furniture construction and other tight, lasting bonds. Both types of hide glue are often used in guitar and stringed instrument construction. Best of all, it won’t harm your wood’s finish. 5. Epoxy is the best wood glue for filling in gaps and cracks. Unlike the liquid texture of other wood glues, epoxies thicken to a putty-like consistency. This wood glue is a two-part formula, consisting of a resin and a hardener that interact right at the time of application. Once cured, epoxy’s durability and waterproofness make it favored by woodworking experts. For example, epoxies are often the go-to wood glues for joining wood in boats and sailing vessels. Epoxy glue works best with clean, dry, and sanded surfaces. First, wipe your wood with an appropriate cleaner to remove any dust, waxy build-up, or other residues. Next, gently buff the surfaces with paper towels and air-dry fully. Finally, make sure your wood is sanded and ready to join. Then you can mix your two-part epoxy and apply according to package directions. Have a wood clamp handy if you are joining two surfaces. While epoxies are considered non-toxic, they are irritants and can cause rashes and burns. Wear gloves and keep your hands away from your face and eyes. For woodworking projects to succeed, they need strong joints—and strong joints need strong adhesive. The following wood glues have garnered the best ratings from Amazon consumers, so you know you can count on them. 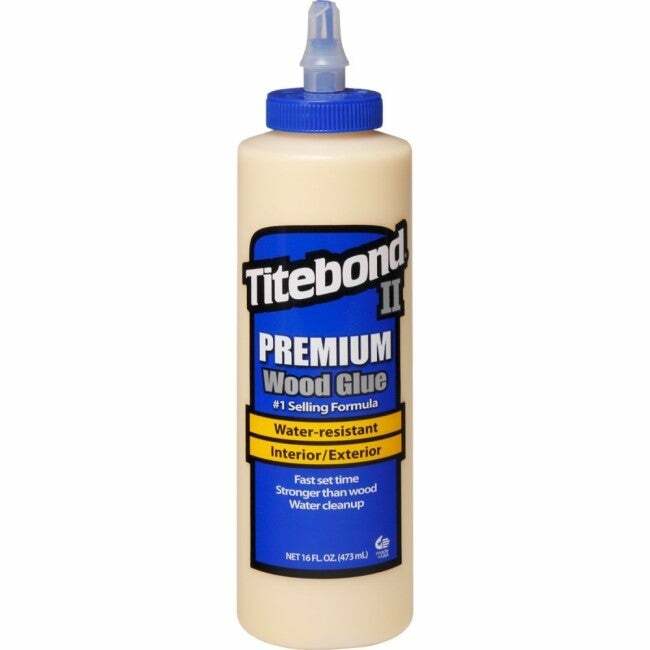 With an average 4.5-star rating on Amazon and nearly five stars from happy Home Depot customers, Titebond II is FDA-approved and more water-resistant than most PVA glues. This makes it a perfect choice for small outdoor projects, like birdfeeders and mailboxes. It is safe to work with and easy to clean—simply wipe away extra glue with a damp cloth. Available at Amazon. 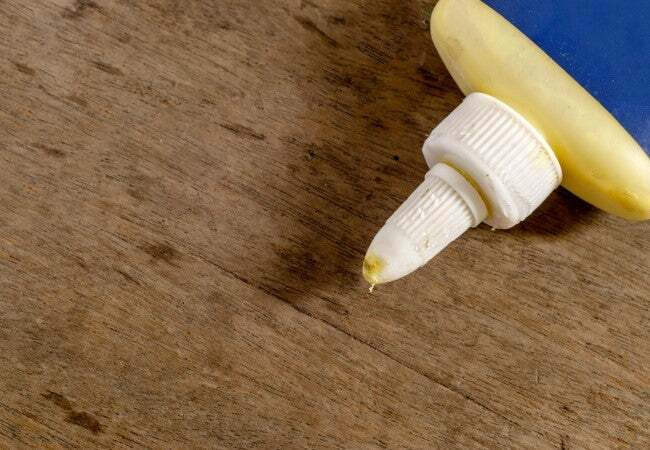 An Amazon Choice product (ranked for top quality, price, and immediate shipping), Franklin’s polyurethane-based glue dries to a clear, pale yellow color. It bonds not only with wood, but with metals, ceramics, and plastics—perfect for multimedia projects and crafts. It is highly waterproof, so consider polyurethane glue for outdoor projects like decking that need to withstand wet conditions. It sands easily, and the label claims it should not affect your wood’s finish. While that may be true, always remove excess glue if it bleeds into visible places. Available at Amazon. For woodworkers and crafters alike, Starbond Super Glue is a favorite formula. The popular wood glue dries clear, glossy, and fast—all of which earns it 4.7 stars on Amazon. Use Starbond CA glue for small, delicate repairs—and even as a wood finish. Professionals rave about its glossy and resilient coating, perfect for woodturning projects. 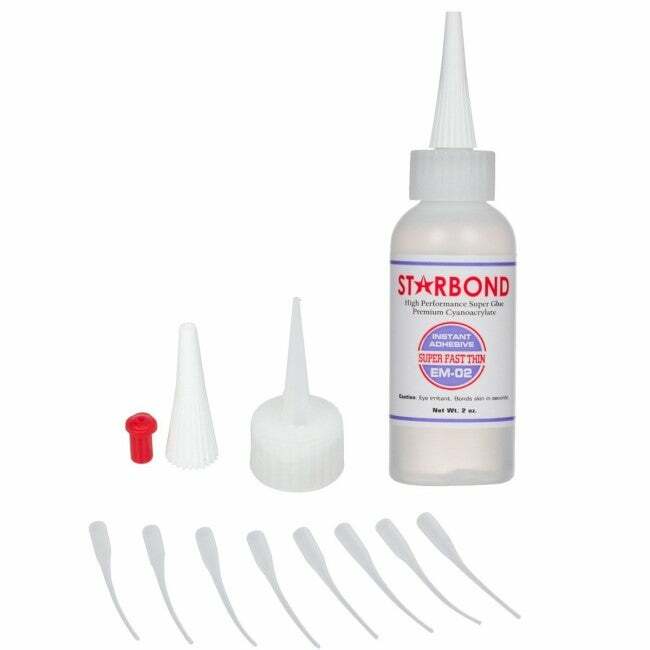 With a longer shelf-life than many CA glues, Starbond comes with deluxe features including applicator caps and micro-tips for precision work. Store in the refrigerator (away from children). Available at Amazon. 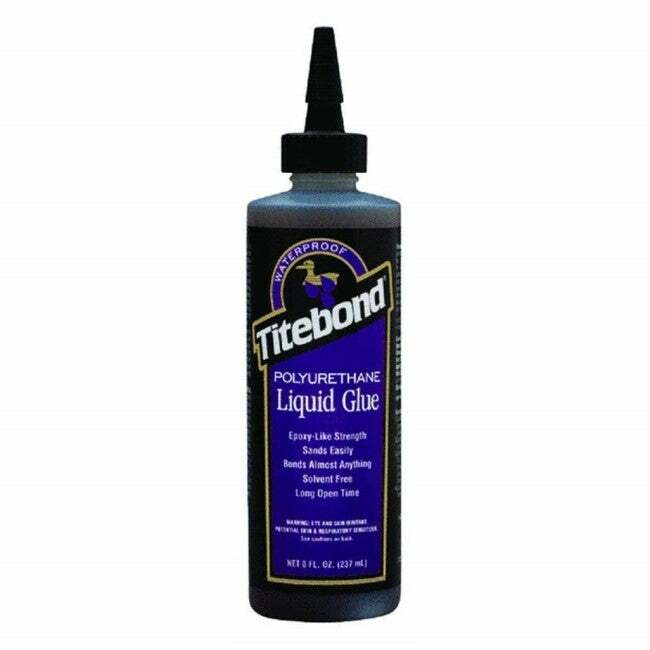 Titebond Liquid Hide Glue beats out other competitors, with a slight advantage in terms of bond strength, odor, and transparency. It is also widely available, and customers give it high marks on Amazon—76 percent rate it five stars. Best of all, it won’t affect your finish, which is especially important when repairing antiques. It comes ready to use and doesn’t need to be heated. Available at Amazon. 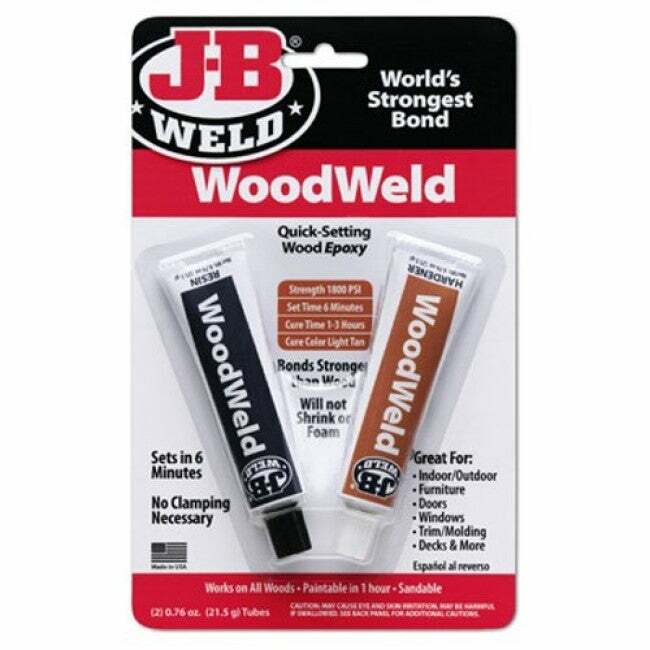 For DIY home repairs, JB Weld epoxy glue is easy-to-use and affordable. It was selected as the 2018 epoxy wood glue of choice by Tools Reviewer. Unlike many epoxy products, JB Weld will set in minutes—no clamping required! The glue will take one to three hours to fully cure, producing a strong bond or crack filler that can be sanded, drilled, and finished as needed. A great solution for small repairs needed on wood floors. Amazon customers give it 4.4 stars on average. Be aware that the 2-part product, when mixed, dries very fast. Read all instructions ahead of time and have your surfaces prepared and ready for action. Available at Amazon.